The Sixth Meeting of States Parties (6MSP) to the Convention on Cluster Munitions (CCM) took place from 5 to 7 September 2016 at the Palais des Nations in Geneva. 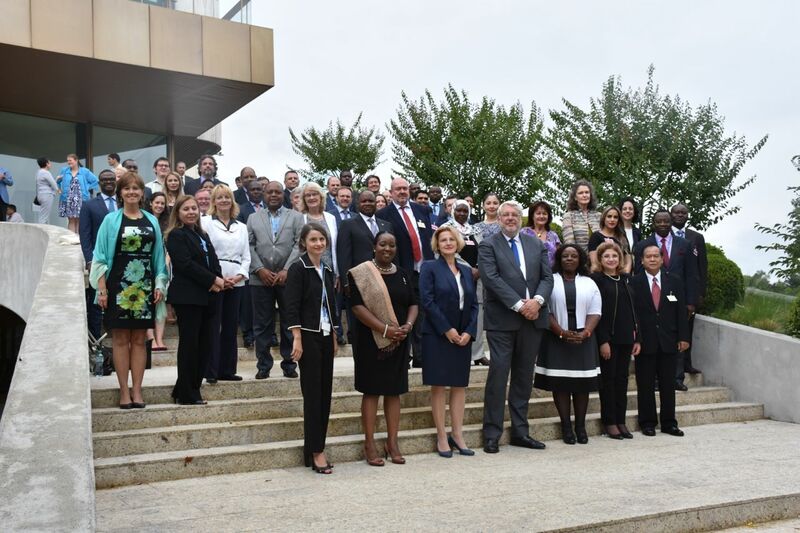 The 6MSP, presided by the Netherlands, marked the first formal meeting of the Convention after the adoption of the Dubrovnik Action Plan, a five-year action plan that provides a roadmap for States Parties to implement and universalize the Convention. At the end of the 6MSP, States Parties adopted a political declaration. Through the political declaration, States Parties commit to fully implement all of their individual and collective outstanding obligations as quickly as possible and as conditions in affected states would allow in partnership with the United Nations, the International Committee of the Red Cross, the Cluster Munition Coalition and other non-governmental organizations, with an aim to implement all before 2030. H.E. 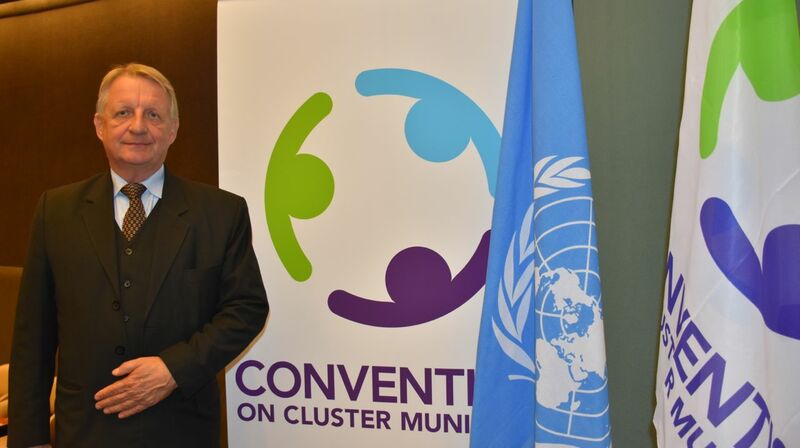 Ambassador Henk Cor van der Kwast, Permanent Representative of the Netherlands to the Conference on Disarmament in Geneva and Disarmament Ambassador at large, who presided over the meeting, handed over the Presidency of the Convention on Cluster Munitions to H.E. Ambassador Michael Biontino, Permanent Representative of the Federal Republic of Germany to the Conference on Disarmament in Geneva. Final documents, including the Geneva Progress Report and the Final Report can be found here. 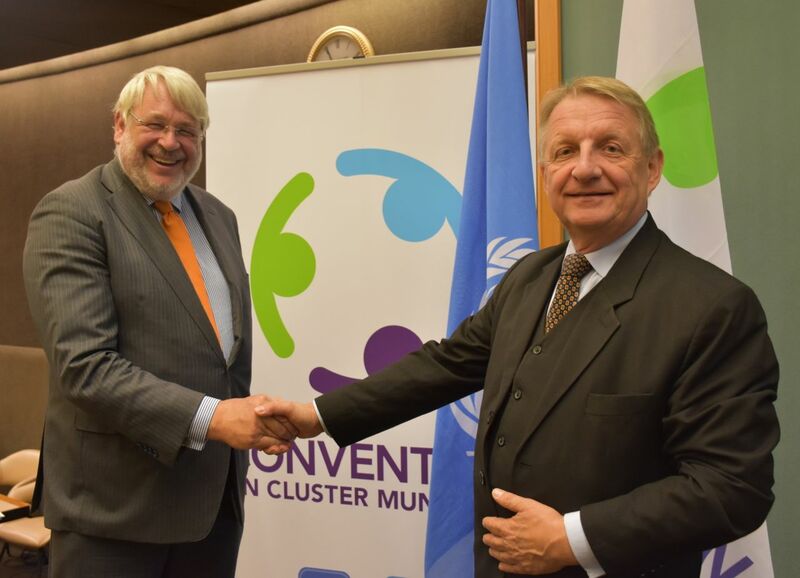 Ambassador Henk Cor van der Kwast, President of the Sixth Meeting of States Parties presided over the meeting. Sister Denise Coghlan, Director of the Jesuit Refugee Service Cambodia, founding member of the Cluster Munition Coalition, which was instrumental in bringing about the 2008 Convention. Statement by Cuba on the status of its adherence process. Coordinators, Switzerland and Czech Republic, reported on the overall status of the Convention and content of the Geneva Progress Report. Coordinators, Ecuador and Zambia, reported on progress and challenges. States Not Party were invited to express their views/support for the Convention. Namibia announced its desire to join the Convention within the next few months. Coordinators, France and Mexico, reported on progress and challenges in implementation. Coordinators, Bosnia & Herzegovina and Norway, reported on implementation. Coordinator, Costa Rica, reported on progress and challenges in implementation. Coordinator, New Zealand, reported on progress and challenges in implementation. Coordinators, Australia and Chile, reported on progress and challenges in implementation. Coordinators, Austria and Iraq, reported on progress and challenges in implementation. The Meeting warmly welcomed the election of H.E. Ambassador Michael Biontino, Permanent Representative of the Federal Republic of Germany to the Conference on Disarmament in Geneva. The following States made comments and/or amendments before the adoption of the 6MSP Political Declaration (read-it-here).